Perfectionism is a disposition to regard anything short of perfection as unacceptable. However, perfectionism can be viewed as a motivator for wanting to achieve one’s best and in turn can cause despair if you are unable to be the best. When perfectionism goes beyond the need to achieve high-standards to become distressing is where therapy can be helpful to understand those thought patterns and behaviors, in addition to identifying positive perfectionist tendencies that can be beneficial in striving for personal standards, organization, and academic and athletic success. The negative tendencies are seen in maladaptive patterns of ruminating over concerns with mistakes, doubts, criticism, and comparison to others. 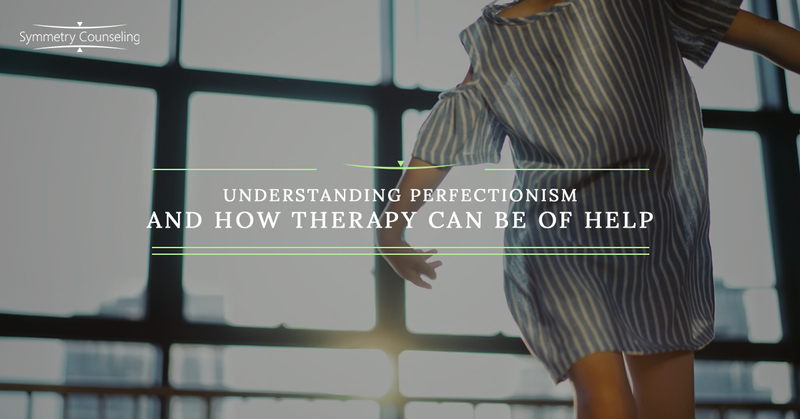 When presented as an area to address within therapy, it is helpful to gain more of an understanding of the types of perfectionism that may be causing distress. This is completed through an assessment process to identify what areas the high standards are set the most in and what consequences are felt if those standards are not met. Also, noting how impacted one’s self-worth can be dependent on the achievement level of those set standards. Specifically, identifying which of the three dimensions of perfectionism are most applicable for the individual. The first dimension is self-oriented perfectionism, as seen in setting those unrealistic expectations for personal standards such as physical appearance and hygiene. Second is other-oriented perfectionism which includes outside events such as work and school performance standards. Third is socially prescribed perfectionism where the perfectionists experience comparisons to others and can bring on feelings of social anxiety in social situations. Perfectionism may have origins in childhood with expectations from their parents and comparison to one’s siblings. It can also be a learned behavior in observation of others, media, or any imposed fear that may occur through childhood and adolescence. There is also a correlation between perfectionism and Obsessive-Compulsive Disorder (OCD) and Obsessive-Compulsive Personality Disorder (OCPD), with the tendency to believe there is a perfect solution to every problem, along with pervasive patterns of orderliness and perfectionism at the expense of flexibility and openness. Other therapeutic concerns such as anxiety and social anxiety have shown a presence of perfectionist tendencies. Treatment for perfectionism tends to coincide with other mood disorders or presenting concerns to provide a better understanding of how one perceives social-oriented pressure or how one takes criticism. Perfectionism stems from biased beliefs, assumptions, and predictions, in addition to irrational thinking patterns of all or nothing thinking, using “should” or “must,” and focusing only on the negative. One common example is a student fearing a bad grade as the parents have emphasized only excellent grades as the set standard. However, this may just be how the student has perceived the pressure as the parents may have just expressed hope for the best effort put forward. Within therapy, two main therapeutic approaches are used. The first is Cognitive Behavioral Therapy, which can be beneficial through self-report measures, diaries, and behavioral observation, specifically looking for responses associated with cognitive features, standards, and how things have been impacted over time. This strategy uses measures and scales to note where the impact is affecting one’s daily mindset and functioning. Another approach is utilizing Dialectical Behavioral Therapy and incorporating mindfulness to focus more on present-minded thinking and to lessen the intensity of perfectionist tendencies. The overall goal is to present and practice realistic thinking which can combat irrational thoughts. Encourage flexible thinking patterns and having more fluid set standards for achievement. Therapy can educate and challenge those thoughts that create the rigidity of needing things to appear perfect. Creating an open mindset towards seeing the irrational thoughts and overgeneralizations to breaking tasks down to aide in overcoming procrastination. The key is to ask oneself is if the thought process and behaviors are being helpful or not helpful. We may never be able to lower expectations but taking away the fear of failure that is seen when those are not met is the overall goal.